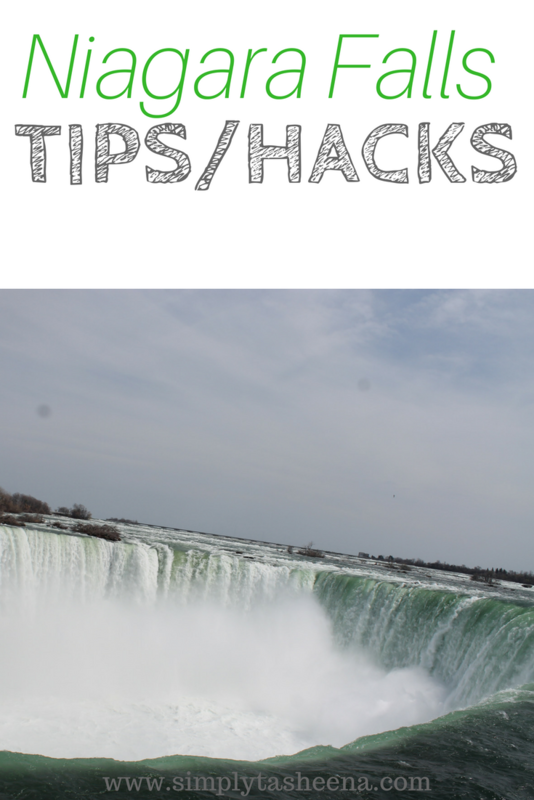 Today I’m sharing some helpful tips when visiting Niagara Falls Canada. When booking a room. Make sure to get a view with the Falls view. That’s the point of visiting Niagara falls. It’s so breathtaking to watch at night and beautiful to see in the morning as well. In my opinion, it’s worth the extra money to purchase the view room. The Skylon Restaurant typically has a Groupon. If you know that you’re planning a trip. Start searching for the Groupon in advance and make sure that it does not expire prior to your vacation. Also, please note that the restaurant with the Groupon you check-in first and you do not immediately get in the line for the elevator. Also, if you don’t want to take the picture that is offered prior to getting on the elevator don’t take it. The Groupon includes the cost of the ride to the restaurant. Also, I want to mention that if you do purchase a Groupon, you have to make a reservation 24 hours prior your requested reservation time. You can easily make a reservation online 24 hours prior to. If you’re a Starbucks drinker like myself. Know that the Starbucks at Niagara falls does not honor the Starbucks rewards and it is pricey. It’s not going to be the same price as your typical Starbucks. Which is common for tourist areas. Some places may not honor your Starbucks gift card as well. Depending on what hotel you stay at and if you want to stay within walking distance. The hotel area lacked stuff for teens.This is just in my opinion. Honestly, I probably would have driven to the Toronto if I felt like driving. I did see Groupons for various arcade stuff and shows. However, there wasn’t anything that my teen would be interested in doing. The hotel that we stayed at was connected to the casino. I believe the parking at the hotel was $20 a day with in and out privileges. I opted to park at the Casino for $5 for my entire stay. The price does fluctuate based on the day. When I first parked it was $10 for parking without in and out privileges. Prior to trying any restaurants, I went to Trip Advisor for views. I found several restaurants that I did enjoy based off of the reviews. Groupon had a lot of choices when it came to food and activities. I would suggest purchasing the Groupons in advance to ensure that they will not sell out of the offer. Also, make sure that you read the guidelines prior to purchasing and expiration date. I hope to make it here one day. I've always wanted to see it in person. I'll keep this post in mind. I want to try out that restaurant! With all the useful tips you have shared, I think I'm good to go whenever I want to visit Niagara Falls Canada. Niagara falls are top on my list, yet awaiting the day to tap it! I've been to Niagara Falls. It was much smaller than I imagined, but outstanding nonetheless. How strange though that Starbucks refuses to honor the gift/rewards cards in touristy areas. Great tips! I live not too far from there and this will definitely help save a few $$ when I go! Thanks! I live so close to Niagara Falls and I have yet to visit! Crazy huh? But I certainly wouldn't mind saving some coins when I do finally visit. My father visited Niagaras Falls in early 70's and he was always telling me the stories about that. He loved everything there...wish I will visit it one day myself. I know I have to think of Groupon more when I travel. I know it has some great deals but I just don't think about it enough. Thanks for the reminder. I always wanted to visit the falls. I will make sure to check into Groupon when I do. Thank you for these handy tips. I really love to see this place in person. It would be a dream come true to be able to go there. I'll remember your tips if ever I'll visit. Great tips there! I would also add going by the falls to catch the night light show they put on.